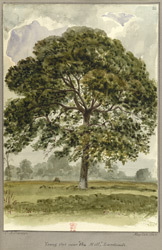 View of a young oak tree at Landwade, Cambridgeshire. Landwade is an ancient manor on the border between Suffolk and Cambridgeshire, about 4 miles north of Newmarket. Landwade Hall and manor was for centuries the home of the Cotton family. They employed John Chessel Buckler to redesign the old Tudor manor house and, during its rebuilding, Buckler took the opportunity to take several views of the estate during April and May 1848.